Note, if you can't run Flash, see the Accessing mathies Tools page. 1. 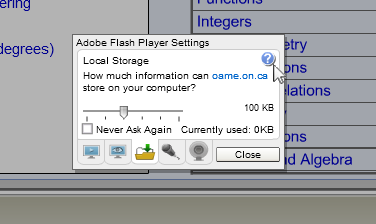 Right-click on the CLIPS Flash Container to get an Adobe Flash Player menu or visit https://www.macromedia.com/support/documentation/en/flashplayer/help/settings_manager04.html and skip to step 5. 3. Click the question mark icon. This will launch a web page from Flash. 4. 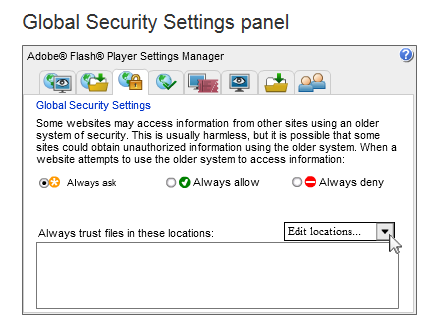 Click Global Security Settings Panel in the Table of Contents at the left. 5. 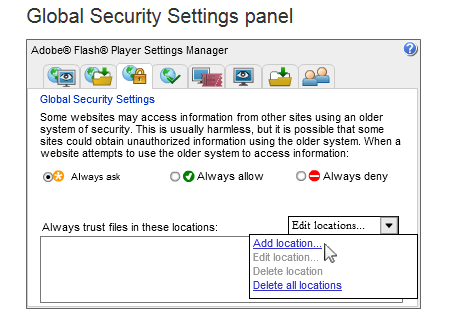 Click the Edit locations... drop-down at the right of the Adobe Flash Player Settings Manager. containing CLIPS and click OK.
9. The folder should now appear in the "Always trust files in these locations:" list. 10. Close the active web page from Flash. 11. 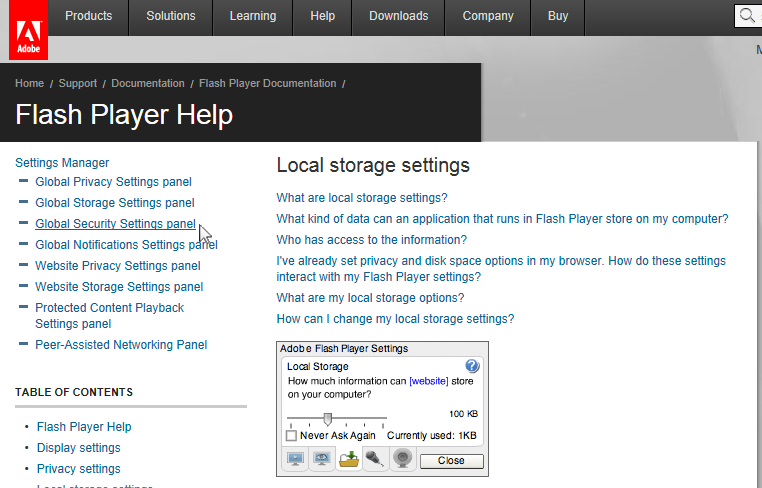 Click Close on the Adobe Flash Player Settings dialog. 12. Refresh the CLIPS web page to ensure that your settings are applied. 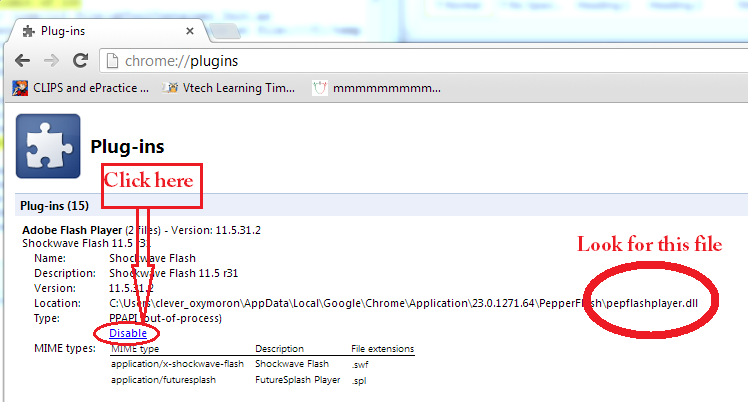 Chrome bundles a custom embedded version of Flash Player which may not work as described above. You can replace the embedded version with version supplied by Adobe. 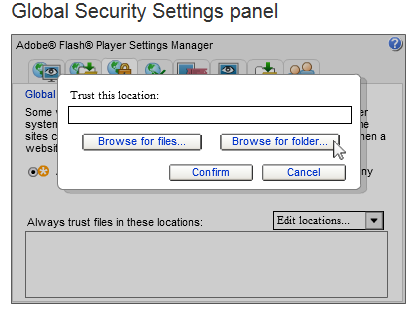 Step 3: Disable the version of Adobe Flash Player that has the file "pepflashplayer.dll" at the end. Step 5: Close and re-open browser. Go back to the link you were trying to use. Did you know that you can drag an HTML or SWF file directly into a browser window to open it? See https://support.google.com/chrome/answer/6258784 for more details about using Adobe Flash Player with Chrome.